What Scene? a multimedia special events company, and entertainment organization Broad Street Music Group (BSMG), leaders of the RECphilly initiative, today announced their plans to host a night of performances from celebrated Philadelphia musicians at the 28th Annual South by Southwest (SXSW) music, film, entertainment and technology conference, in Austin, TX. More than 400 people are expected to be at Trinity Hall's Old School Bar & Grill (an official SXSW venue), located at 401 East 6th Street, from 8p.m. - 2a.m., on March 20, for the show. For Philadelphians attending the SXSW conference without conference badges, tickets are available for $10, at the venue. iradiophilly will be LIVE Broadcasting the Official Philadelphia Showcase down in Austin, TX on March 20th. You can listen for FREE at http://www.iradiophilly.com/phillyshowcase or on our free iPhone and Android apps. 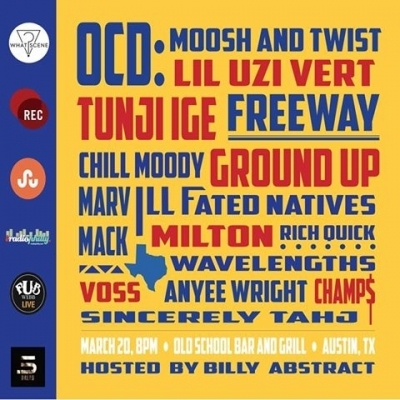 The first-ever SXSW show for the startups will feature an all-Philly lineup, including veteran emcee Freeway, emerging groups OCD: Moosh and Twist and Ground Up, and local artists such as Chill Moody, Tunji Ige, Milton, and Lil Uzi Vert. For What Scene? and RECphilly, this show is the result of years of organizing, management, relationship building, and love for Philadelphia and its ever-evolving music scene. Both companies will also partner with local media organizations, WXPN and iRadioPhilly, among others, to promote and develop its official SXSW stage. Additional event sponsors include social networking site StumbleUpon and entertainment venue Pub Webb Live. "We’re really excited to provide a stage with global potential to artists who rightfully deserve it,” said Brandon Potter, creative director, What Scene? “We’ve set the bar for innovative events, here, and we’ll do the same in Austin. This show is only the beginning, and will open doors for more artists, in the future." What Scene? and RECphilly will document their venture to SXSW, and will release it as a video recap, at the conference's end. Their journey will also be shared on social media, in real time, via their Twitter and Instagram accounts. RECphilly/BSMG began in the fraternity basement of a local university, in 2012. Founders Silver and William Toms wanted to give opportunity to local musicians and performers, so they formed an organization that offered artist development, booking and event management. The award-winning start-up company has since hosted more than 125 shows featuring 1,200 rappers, singers, bands and other performance groups, at 25 venues in the Philadelphia-area. In 2010, What Scene? was created as an entertainment blog for underground music, movies, TV shows and videos. Potter founded and ran the website for two years, until he and two friends decided to get involved by organizing local, in-person events. In 2013, the trio rebranded What Scene? as a multimedia special events company. What Scene?’s first event was music festival Foxtail Fest, held in Wilmington, DE, in 2013. It featured rap artists Machine Gun Kelly and Travi$ Scott, and since then, the company has curated 10 events, wherein more than 3,000 persons, in total, attended. For those who cannot make the trip to Austin, TX, both companies will host a send-off concert/show on Saturday, March 14th, at Pub Webb Live, near Temple University’s campus. This concert, beginning at 9:00pm, will feature the local acts that will perform on the official SXSW stage. iradiophilly will be LIVE Broadcasting both the Philly Kickoff Show on March 14th and the Official Philadelphia Showcase down in Austin, TX on March 20th. You can listen for FREE at http://www.iradiophilly.com/phillyshowcase or on our iPhone and Android apps.